5:38 this morning the phone rings, jolting us out of the last stages of sleep. I say “just pick it up and then hang up” as Betsy reaches for the phone “No wait! It might be the Post Office calling to tell us the turkeys are here!”. Indeed the case and we are off and running, Betsy driving to Graham to pick up the box filled with little chirpers and me across the field to finish up the brooder preparations. By 7:00 they are all installed, eating, drinking and running around. 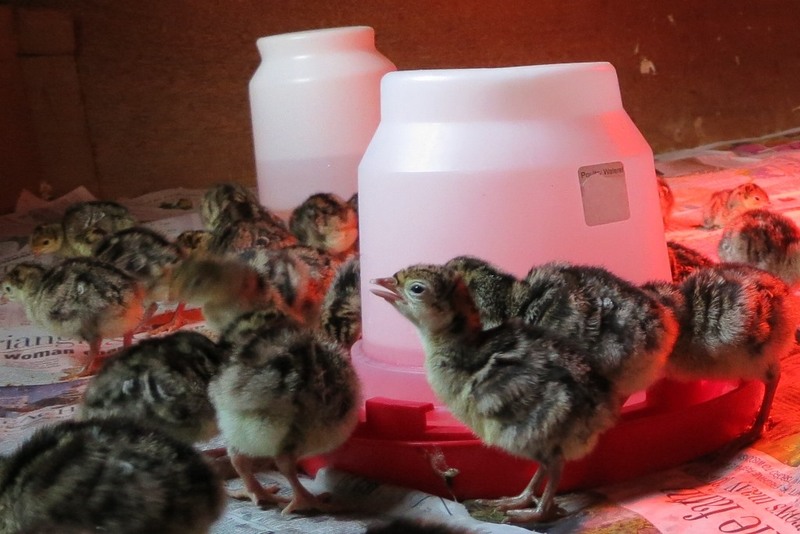 You may remember this newsletter from June when I was debating if we would raise turkeys this year and the specific hurdles to doing so. Well those hurdles have mostly been cleared. 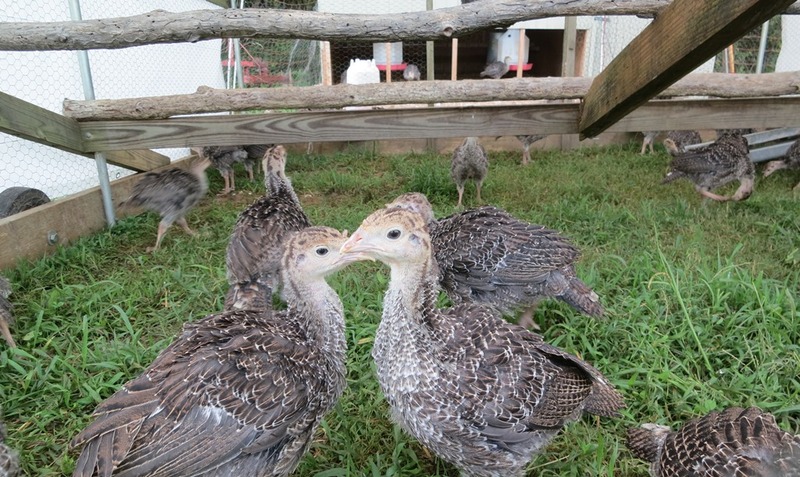 The feed plant problems have been solved, the availability of poults later than normal worked out and a processing date has been secured the week before Thanksgiving allowing us to have fresh birds and avoid the freezer plant issues. One more time around the block. 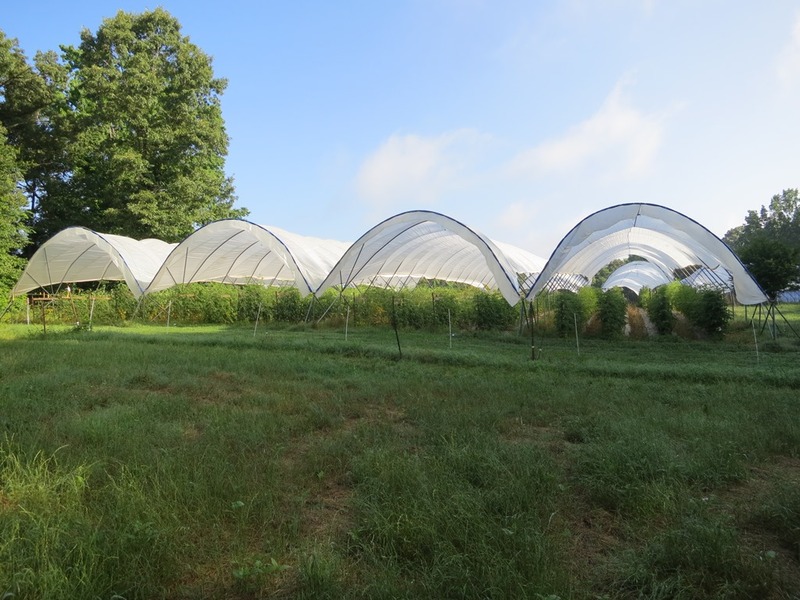 A fun event coming up a week from today The Crop Hop at the Barn in Fearrington Village is a fundraiser for the Farm Sustainability Programs at the Rural Advancement Foundation International (RAFI). Live music, square dancing if you are so inclined, microbrews and some deserts all for just $10-20. We will be there as I am on the Board of RAFI, one of the oldest and most important of all the sustainable agriculture organizations in the country. They do great work in many areas of agriculture but this night we will be focusing on the work they do to help save family farms from going out of business. Come on out for an enjoyable evening and support sustainable farms. Once again we have made it through July and it is time for our annual August break so no newsletter for the next two weeks. After market this Saturday, Betsy and I will be laying low for two weeks, taking short road trips, going out to eat and just taking it easy. The exciting party (really) is we are going to focus on moving into the new workshop, building a work bench, putting up shelves, sorting and organizing all the tools and supplies that are strewn across five buildings; Betsy has been waiting for this for years! Jennie and Liz will be working next week and expect to see them at market, maybe both Wednesday and Saturday. They will both then have a week off and we will not be at Market at all on the 17th. When we come back it will be full pepper season and roasting should begin on the 24th. Yep didn’t get a newsletter out last week, just one of those weeks when none of the stars aligned and maybe the effect of the first week of stifling summer weather was not helping either. Writing happens early in the morning, before the normal work day begins and we were out early several days last week trying to beat the heat. We did get plenty done but still we are running a bit behind from all of the rain delays. We are pushing hard this week to get caught up and stay on schedule with the first of the fall planting. 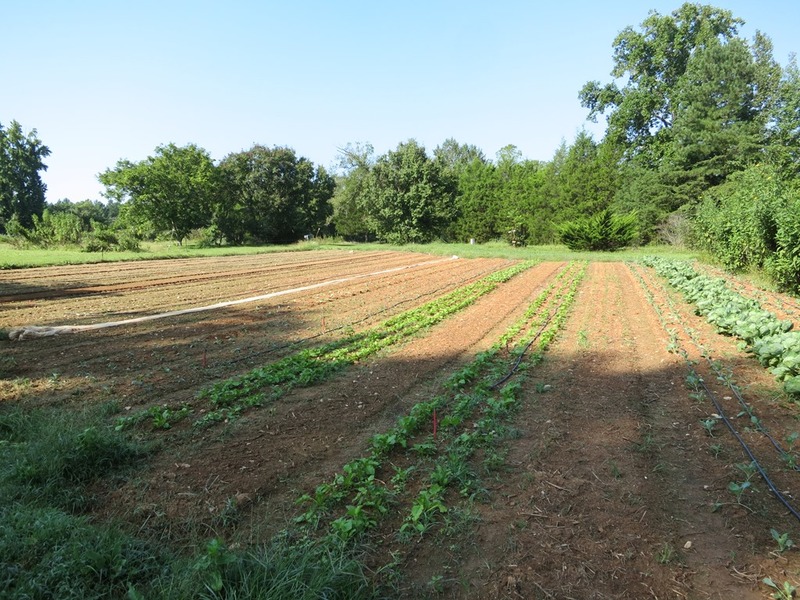 I know, hard to think about celery and Brussels sprouts when it is still hot and July but now is the time we are all trying to slip the first cool season crops in the ground so they will be ready when the weather ameliorates. And the mowing, the endless, deep and sometimes futile mowing but we have to keep cutting the grass and weeds back until they begin to run out of steam, if for psychological reasons if nothing else. One more farm dinner this weekend, the second of Panzanella’s summer Farmers’ Market dinners featuring several farms at one time. Special menu items on both Saturday and Sunday. I know a yellow gazpacho from our tomatoes for sure and I suspect some fried green tomatoes too. Not sure which night we will go to eat but we surely will not miss out. Celosia Fest, can you say dayglo? It’s Tomato Week! Three big tomato centric events this week and near the peak of our harvest. First up Thursday is our farm dinner at Foster’s Market in Chapel Hill, this year with Flo and Portia from Chapel Hill Creamery, the menu looks great (can you say caprese salad?) and there may still be some spots left but you better call today. Second on Saturday is the big annual Tomato Day at the Carrboro Farmer’s Market with over 70 varieties to try, a raffle and several dishes to sample including an heirloom tomato gazpacho made by Seth Kingsbury from Pazzo Restaurant from our tomatoes. Betsy usually dreams up something for us to sample too, maybe a Green Cherokee tomato juice? Lastly on Sunday is a fun, tasty and educational afternoon at our Heirloom Tomato cooking class at A Southern Season. 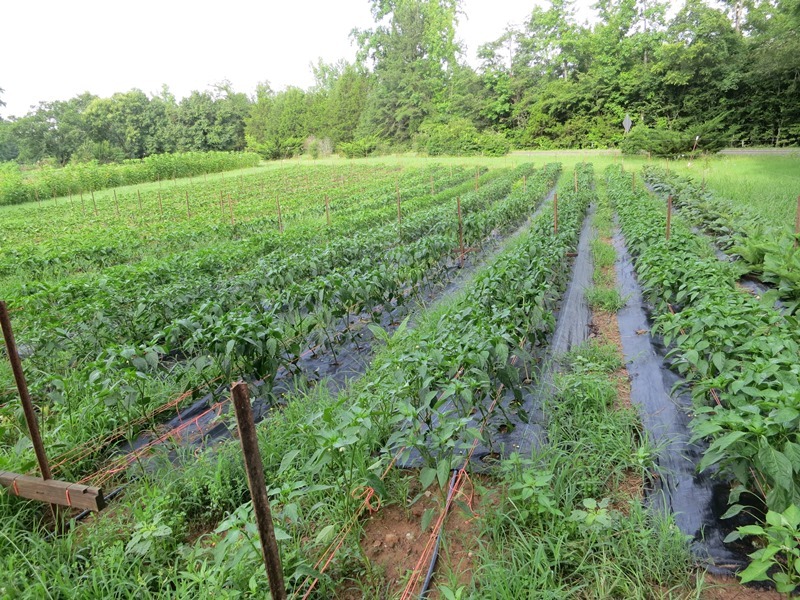 This is the fifth year we have worked with Craig LeHoullier, known as NC Tomato Man and the person who introduced Cherokee Purple to the world and personally keeps over 1400 varieties of tomatoes in his collection. We talk about the different kinds of tomatoes, growing them and of course cooking and eating them. Still spaces left but hurry. The rains seem to not want to stop and our thoughts go out to all of our farmer friends who are having increasing problems from too much water. More flooding for farms in the mountains to diseases and fruit splitting getting worse with every damp day. This is one of those seasons that you just grit your teeth and work through. You should savor every tomato that you can this summer and be glad that you don’t grow them for a living. The lack of sun is the limiting factor in the flower department but this is what we should have. 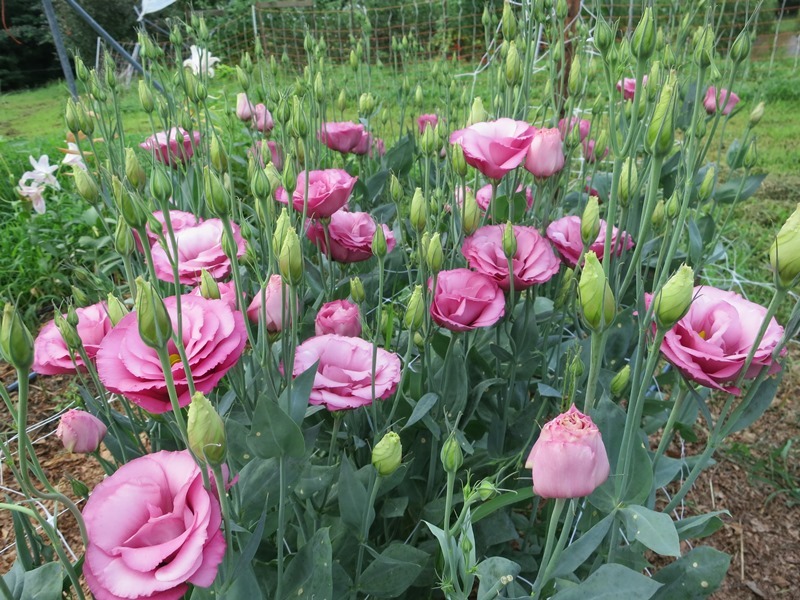 It is the peak of the queen of cut flowers, Lisianthus, maybe one of the best looking crops we have had in years, tall with thick stems and lots of colors. It is still Lilypalooza, lots of long lasting fragrant pink Oriental Lilies and yellow and pink Asiatics too. 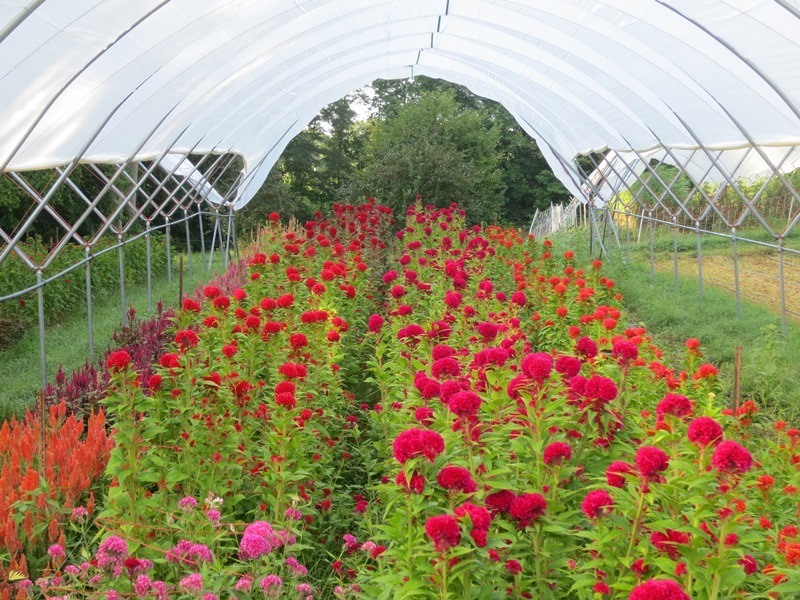 Brilliant Zinnias. Beautiful Bouquets of course. Maybe the peak of our season? Plenty of reds with both the sweeter Ultra Sweet and more balanced Big Beefs. A good amount of Cherokee Purples. Smaller but fair quantities of of most of the other colors- yellow with Orange Blossom and Kellogg’s Breakfast and the higher acid Azoychka, German Johnson pinks, bi-color Striped Germans, Green Cherokee too. A good mix of sauce tomatoes with both the Italian Oxhearts and beautiful Romas. Fair amount of Sungolds, Blushes and SunMix cherries. Cucumbers. Sweet Red Onions and the Long Red of Tropea Italian cooking onion. Basil for the tomatoes! 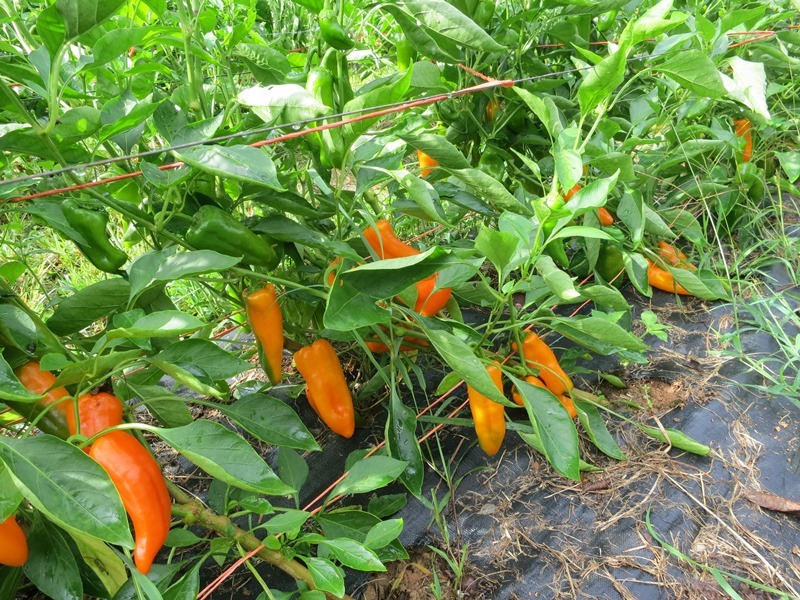 The first of the pepper crop with Shishitos, Padrons and Serranos this week. A bit wet and steamy lately? This is exactly the weather we used to have nearly every summer back in the late 90’s and early 2000’s which eventually lead us to import the Big Tops from England in 2004. All organic tomato growers fear this kind of weather which leads to all kinds of leaf diseases (and other problems) that they really don’t have any tools to use to protect the plants. 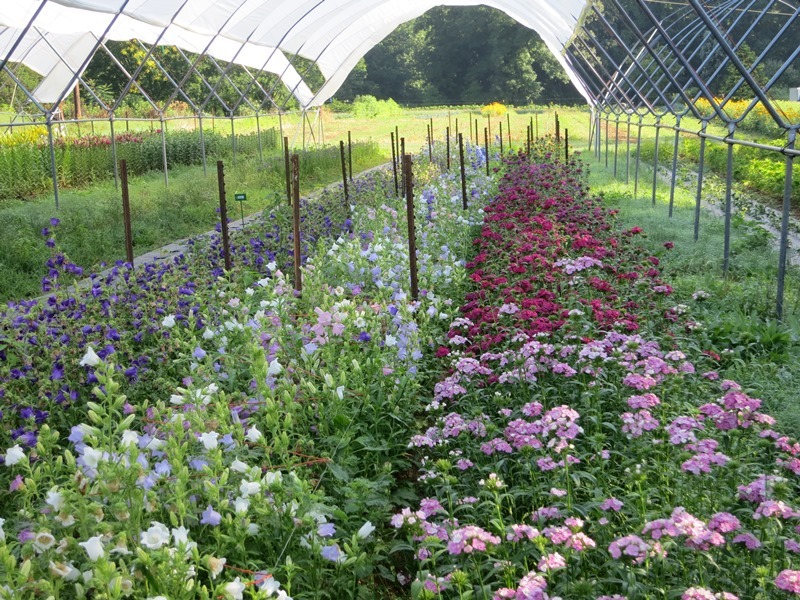 Conventional growers have many sprays they use on a weekly basis to slow down the diseases. We have told this story many times but it turns out we have a fungal disease that attacks our tomatoes that no one else has (just lucky that way). We tried many techniques and materials to try and reduce its effect on our tomatoes including good mulching, raised beds, trellising, pruning, airflow, organic sprays and more, all to no avail. We did know if we could just keep the plants dry it would greatly reduce the spread of the leaf blight. Enter the Big Tops, just big plastic roofs to keep the rain off but with good air flow, as a friend of ours calls them “tomato umbrellas”. It is seasons like this that we are glad we spent the money to build them to insure a luscious crop of fruit. Besides non-stop mowing and weeding there were two big developments this week. I spent most of Tuesday and Wednesday turning under the remnants of the spring crops and seeding the summer cover crops on three quarters of an acre. Followed by a big rain on Wednesday night they should fly up. It has been several years since we have had conditions for great summer cover crops, this looks to be a good season. The second is we passed all of our final inspections on the new building and they turned the power on! Just a few things left to do and Jennie can move in this week, woohoo! It is Lilypalooza, lots of long lasting fragrant pink Oriental Lilies and yellow and pink Asiatics too. Nikko Blue Hydrangeas and maybe a few white Annabelles too. Brilliant Zinnias and Gloriosa Daisies (Black eyed Susans), a sign of summer. Plenty of Sunflowers. Beautiful Bouquets of course. Tomatoes! A moderate supply this week in both the sweeter Ultra Sweet and more balanced Big Beefs in reds and Cherokee purples. A small supply of the great flavored yellow Orange Blossom and Sungolds. Cucumbers. Sweet Red Onions. Maybe the last week of Lacinato or Dinosaur Kale, is really beautiful, time for those raw Kale salads or Kale chips. Last of the spring Leeks too. Plenty of Basil for the tomatoes! While officially summer starts a week from Friday there are a few signals that always indicate to me that summer is really here. Hot temperatures, shorts all day every day, multiple T-shirt days, light until 9:00, fireflies and most important to us real tomatoes! The first day over 90 today, someone said the latest that has ever occurred, check, all the rest has been happening for some time but tomatoes until this week. We have had a few ripe tomatoes over the last week or so but we waited until last night to have the first tomato sandwich dinner. We each have our own versions but mine is BOT- bacon, our red onions and tomatoes. Toasted bread, mayo, slices from the heart of the tomato, salt and pepper. The rest of the tomato I cut into large chunks and have as a side to the sandwich with just a bit of salt so I can taste just the pure fruit and judge where we are in the season. As to be expected the earliest fruit are not quite as juicy or full flavored as they will be later in the season when the heat really hits but are still so much better than any tomato we have had since our last ones nearly nine long months ago. Let the debauchery begin. 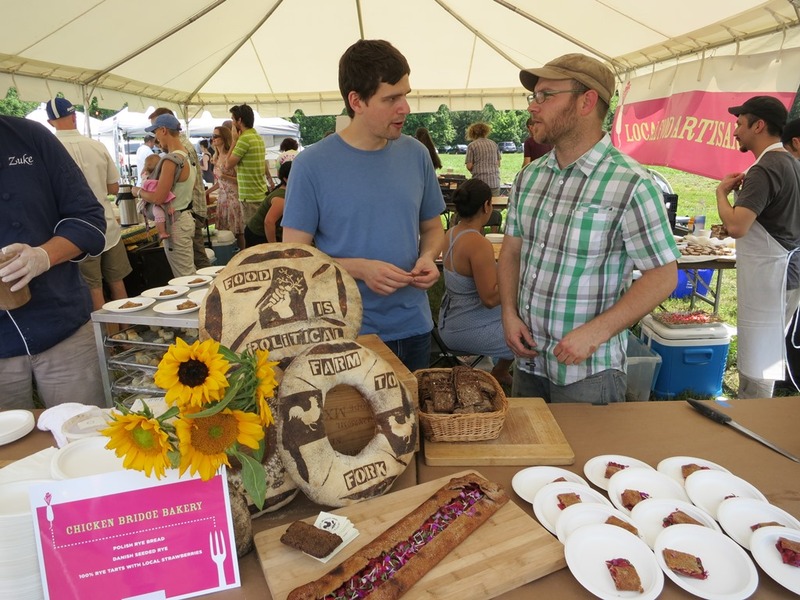 The Farm to Fork picnic went off smoothly last Sunday, the monsoons moved out and the day was beautiful. Some really great dishes were served up and the crowd was happy and spread out with lots of room to roam. Our Smoked Turkey sausage crostini and Early Summer borscht was well received with many folks saying that it was their favorite dish. We had a great time with Scott and Aubrey from Nana’s and thank them and everyone who participated to make it a great event and raise needed funds for new farmer training.